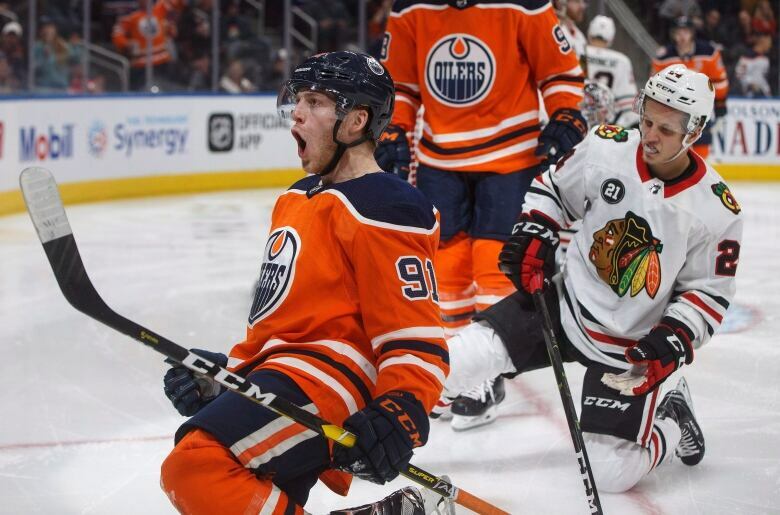 Mikko Koskinen made 40 saves for his first career NHL shutout and Drake Caggiula scored a pair of goals as the Edmonton Oilers pulled out a 4-0 victory over the Chicago Blackhawks on Thursday. Mikko Koskinen knew it could be his last chance at making a name in the NHL. So far his return has been an impressive one. 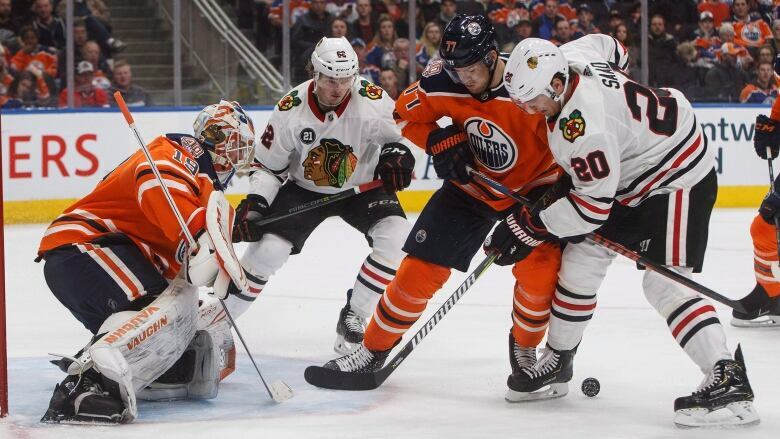 Koskinen made 40 saves for his first career NHL shutout and Drake Caggiula scored a pair of goals as the Edmonton Oilers pulled out a 4-0 victory over the Chicago Blackhawks on Thursday. The 30-year-old Finnish goalie had only previously played four games for the New York Islanders in the 2010-2011 season, having since been playing primarily in the KHL. He signed as a free agent this summer with the Oilers and, after a shaky pre-season performance, has been strong on this side of the pond. He also earned a 5-3 victory in Nashville last Saturday in his only other appearance serving as backup to Cam Talbot. "He was outstanding," said Oilers forward Leon Draisaitl. "That is what good goalies do. He hasn't played much, but he was able to stay confident. It's pretty impressive to see him come out with two performances like that." Koskinen said he always wanted to come back to the NHL and prove himself. "It was always on my mind," said the six-foot-seven netminder. "I had opportunities, like, three, four years ago, but I always decided to stay. I thought I could still get better there [in St. Petersburg], and my set up there was great. "But I always had it in my sight, to come back and try to be a goalie here." "It was a last chance. I couldn't turn it down anymore. Now, I felt it was the right time to come over." 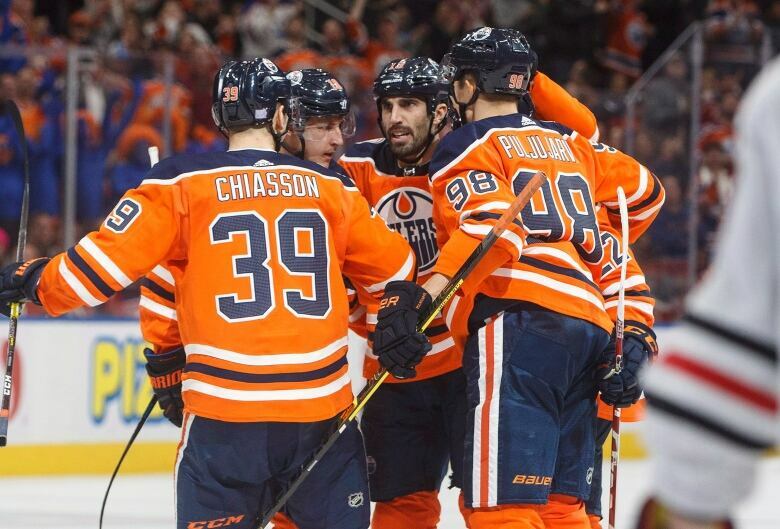 Jason Garrison and Alex Chiasson also scored for the Oilers (7-4-1), who have won four of their last five. Cam Ward made 25 saves for the Blackhawks (6-5-3), who have lost four straight. "I don't know if the frustration level is high," said Chicago captain Jonathan Toews. "At the end of day, though it doesn't look good on the scoreboard. "But for the most part, we're involved and we're in the game giving ourselves a chance to win for the majority of 60 minutes." There were plenty of chances, but no scoring in the first period, with Koskinen making 15 saves and the Oilers putting eight shots on Ward in the Chicago net. The Oilers broke the deadlock 18 seconds into the second period when Caggiula showed some deft hands in front, spinning around and then shovelling home his third of the season while being knocked to his knees from behind. Koskinen made some exceptional stops to keep Edmonton in the lead, stopping Toews on a short-handed breakaway with six minutes left in the middle period, and then Alex DeBrincat in tight later on during the same sloppy Oilers power play. Edmonton went up 2-0 with another power-play opportunity, as Garrison scored on a point blast for his first goal as an Oiler — and first in his last 63 games — with 37 seconds left in the second. The Oilers added to their lead with a short-handed tally seven minutes into the third as Jujhar Khaira did a good job to get it to Caggiula, who froze Ward on a deke before scoring his second of the game. Edmonton got another midway through the third when Chiasson scored his fifth goal in his last six games. Chicago's Brandon Davidson was handed a major and game misconduct late in the third for an elbow on Edmonton's Darnell Nurse, who was frustrated by the hit and had to be held back from going after Davidson. Both teams are back in action on Saturday with the Hawks in Calgary and the Oilers playing in Detroit.